The end is always a new beginning. Life is a full circle. Human intervention has caused several roadblocks in this path of nature, consequences of which our race is struggling to deal with. As per Design Councilâ€™s Annual Review 2002, eighty percent of the environment impact of the product, services and infrastructure around us is determined at the design stage. Design is not limited to just creating new objects to bring a change to our world, but its main aim is to transform the habits, perspectives and lifestyles of people. One designer who shines in bringing such transpositions with his creations is Anuj Sharma. Our friend and associate Anuj has created a niche in the market using existing material creatively and is always eagerly awaited for every year to show something creative and wearable. Anuj believes that design should be sustainable. The cause is dear to his heart and he practices this in all his creations without the typical media hullabaloo that motivates other designers. Instead of using newly created environmentally products, he believes it is better to use what already exists and give them a new and acceptable form. â€œDesign essentially is about bringing a changeâ€, he says. Our minds often get stuck to the most obvious use of an object. The lack of imagination here becomes our biggest enemy, as it forces us to clutter our world with newer objects that we couldâ€™ve done without. When asked to create a bag for people to use to donate their old clothes, he thought of a very simple, obvious and yet a different solution. 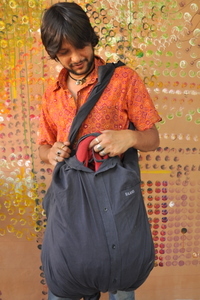 He created bags using old clothes. Avoiding any new material or extreme processing, the process is simple and can be applied to most garments in order to hold clothes. This design can be used in our day to day lives to storage and is especially helpful to people short on space and money. When stacked together these bags form a montage and buttons on the clothes allow easy access to clothes, creating a functional, portable and affordable wardrobe. It is a technique easily learnt, used and passed on. Using existing material in this fashion is an intervention in the productâ€™s lifecyle which prolongs its usage, also making the disposable of clothes more planet-friendly. You should try making these bags too byÂ referringÂ to the slideshow and share your experience with us.